Located in beautiful Airlie Beach, BIG4 Adventure Whitsunday Resort has won over 30 major tourism awards and has a reputation for providing a happy holiday experience that is truly memorable. The resort is set on 26 acres of beautifully landscaped grounds offering a special combination of wide open spaces, stunning tropical gardens and resort facilities that are sure to delight. BIG4 Adventure Whitsunday Resort offers a relaxed, family friendly environment which makes it more like a traditional Australian holiday destination than just a resort. Kids are kept busy outside with games and activities and making new friends while parents enjoy the social atmosphere. 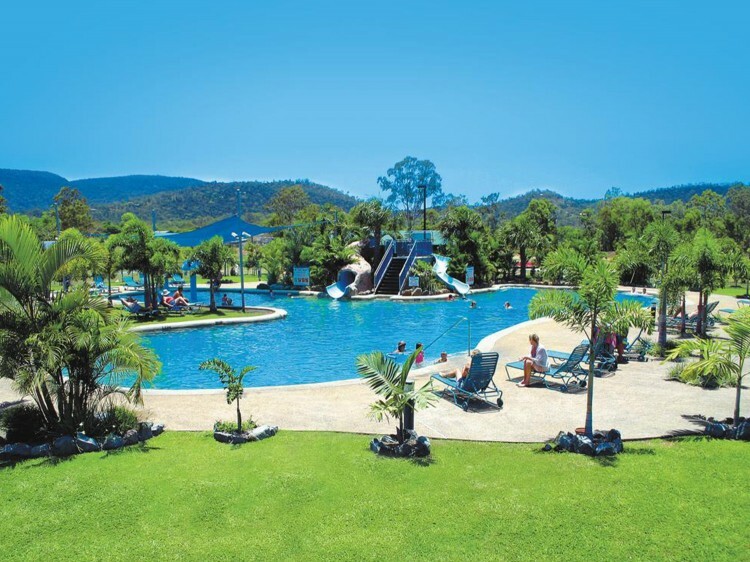 Set amongst lush tropical gardens, the resort includes Airlie Beach’s largest resort lagoon-style swimming pool (heated winter) and water slides, full-size floodlit tennis court, mini-golf course, an outdoor cinema, animal park multi-purpose function venue The Palm House and much, much more. 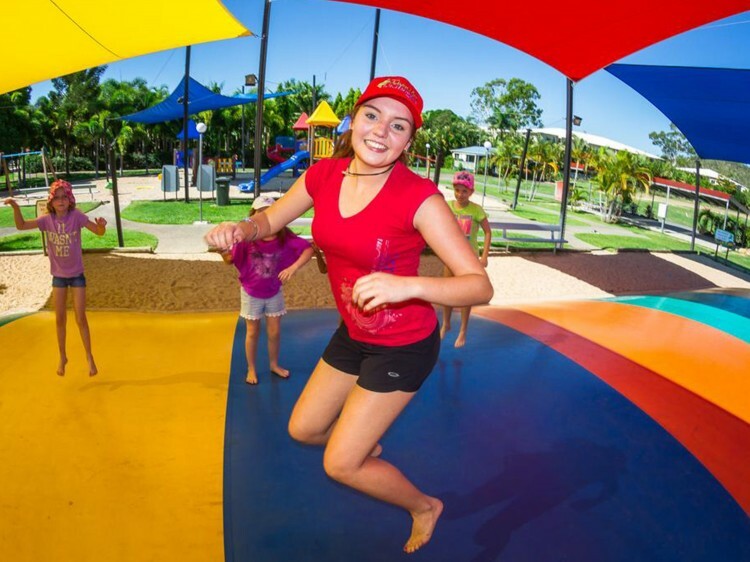 Offering the only mainland Kid’s Club in Airlie Beach and a full-time Activities Co-ordinator, there is a year-round Activity Schedule to ensure there is plenty to do for every age and guest. Renowned for its particularly warm and friendly staff and 23 years of family ownership, the resort prides itself on its huge number of repeat guests. 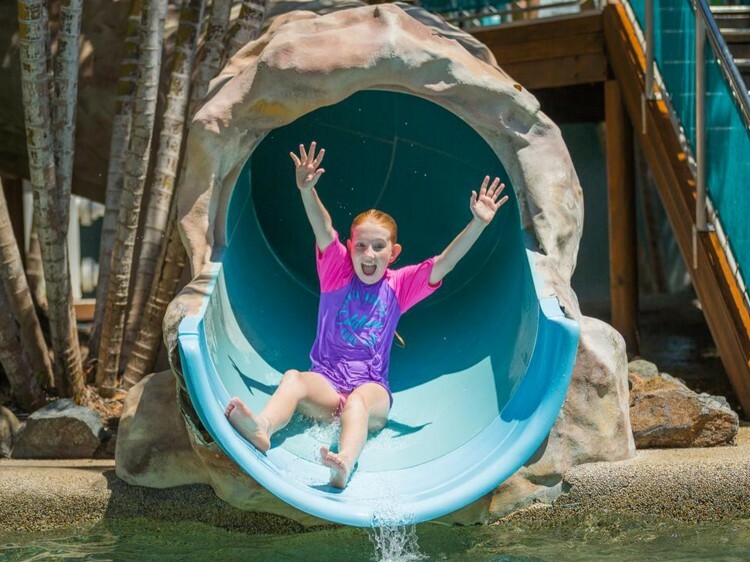 Within easy access to the Great Barrier Reef, Whitsunday Islands and a vast array of trips and water activities, BIG4 Adventure Whitsunday Resort offers the best location for a fun, value-packed, memorable Whitsunday family holiday. Great Interior design and good taste are not normally words associated with a holiday park. With a fit-out by an award-winning interior designer, BIG4 Adventure Whitsunday Resort has lifted the level of accommodation to something only dreamt of in the past. The furnishings and finishes of the three bedroom Luxury Condos and Deluxe Studio Cabins provide unparalleled taste and great holiday design. Imagine a sparkling new decor, bright contemporary furnishings and clean white shutters in a cabin set amongst acres of tropical gardens and you will have pictured the contemporary style and relaxing ambience which has been created to provide you with the perfect environment to enjoy your holiday. 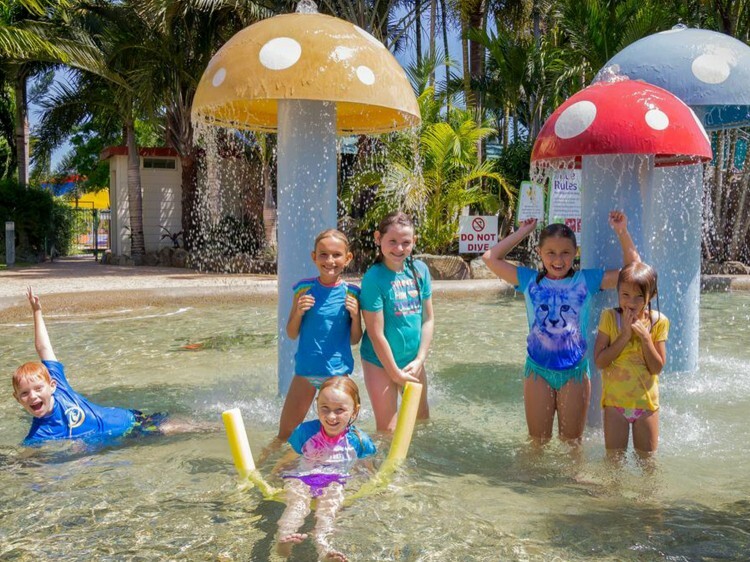 With the largest resort style pool in Airlie Beach (heated winter), the 32m swimming pool is the resort centrepiece and comes complete with two waterslides and three giant mushroom fountains. The swim up spa is a popular place to cool off and relax the days away. Once the sun goes down in the tropics they have many balmy, dark nights with a sky full of stars and the perfect setting for an outdoor movie. With a 15 foot screen and grass sitting area, not only do they show great family movies but sometimes they get their groove on with group Wii Just Dance sessions. The two jumping pillows are a great hit with all age groups. Just like a large jumping castle (but safer) and with their own shade sails, the kids are entertained for hours with non-stop fun. The 18-hole floodlit mini golf course proves to be a challenge for all levels and it's not always the most talented golfer who wins! With its landscaped greens and watering hole it is one of the most popular facilities and a great activity for all ages. Put your bathers on and join in one of the most enjoyable and fun resort pastimes with a mini-golf challenge under the sprinklers! Golf putters are available for hire from reception and froggy golf balls and score cards are available for purchase. Who said it’s all about the kids? Parents can enjoy a selection of massages in the massage hut and the sessions actually coincide with Kids Club and Toddler Time. So in reality, the park actually offers “Parent Time” as well. If the swimming and jumping haven’t tired the kids out, there’s also pedal karts, a full-size flood-lit tennis court, adventure playground, basketball, volleyball, badminton, bocce, giant chess and table tennis to keep them outside all day long. Other entertainment for families can include a games night, disco, BBQ by the pool, wine and cheese afternoons or the much loved pancake breakfast. One of the main advantages of staying at the resort is the wide range of fun activities that are included for families. A full-time Activities Co-ordinator ensures there is something happening every day for the young to the young-at-heart and organised activities can include anything from a scavenger hunt, photo trails and muck-up fun through to arts and crafts or dancing under the stars. A specially designed school holiday activity schedule, including the only mainland resort to offer Kid’s Club, keeps kids happy and occupied from morning to night. Interesting school holiday programs like dance and cooking workshops are also offered free to all guests. With a maximum of four children per session, Toddler Time is a specially designed session for children aged 18 months to five years. The one hour sessions are just enough for kids to have a few fun activities while parents can take some well-earned time-out. Toddler Time is available outside school holiday periods and conveniently coincides with the poolside massages, allowing parents of pre-school children some precious ‘me’ time. BIG4 Adventure Whitsunday Resort has built its very own Animal Park with a collection of kid friendly animals for children to visit and grow to know. With daily feedings and 3.5 acres of space to roam, visitors have a wonderful time getting up close and personal with Albert the miniature pig and his fury friends! Studios feature a bright and open style layout with modern furnishings and a veranda with outdoor seating for two. Bedding is made up of one queen bed, two single bunks and one rollaway bed; a curtain divides the open plan style of the cabin and there is a kitchenette with microwave. Villa feature luxury furnishings throughout, share a gorgeous common grassed area with the neighbours and an enormous veranda with outdoor setting for 6 making them ideal for young families or friends travelling together. The master bedroom has one queen bed and the second room has four single bunks. There is also a Spa and full kitchen with oven and dishwasher. Villas have undercover parking. The tranquil garden setting of the Luxury Condos with their enormous verandas and outdoor setting for 8 people with private BBQ stimulate a sense of relaxation for your Whitsunday holiday. Condos feature a gourmet kitchen with oven and dishwasher, a laundry as well as a spa.Bedroom one has a queen size bed with ensuite bathroom: the second bedroom has a queen size bed whilst the third bedroom has four single bunks. There is also undercover parking for 2 vehicles.